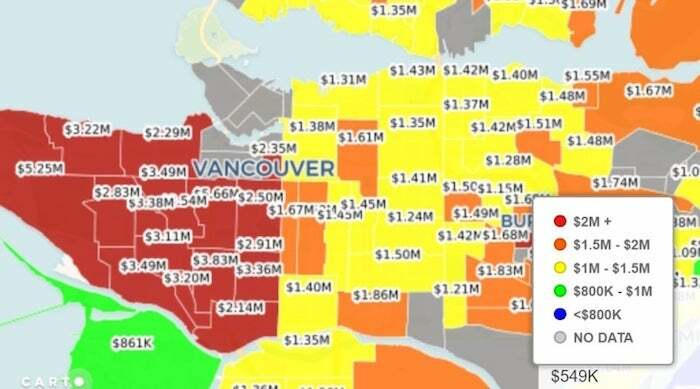 This photo above is a series of interactive heat maps from the real estate website EstateBlock, is a great visual representation of the most to least expensive areas in the Lower Mainland to buy a home. Using benchmark home price data from November 2018, the website created individual price maps for single-family homes, condos and townhomes, in Metro Vancouver and surrounding areas, from Squamish and the Sunshine Coast through to Mission and the Fraser Valley. The number-crunchers also created separate heat maps for each of those home types based on price growth (or decline) since October 2018, and since November 2017. EstateBlock also ranked MLS neighbourhoods in terms of most and least expensive for different home types. For more details on things like why these houses are priced these ways, please contact me at 778.888.8888 or matt@mattgul.com.